Whatever my or anyone’s opinion of the merger, one thing that no one seems to be discussing in the reduction in competition this brings to the market. IT purchasing is quite simple when compared to most other markets). There are limited number of suppliers and limited number of solutions for any given market category. Customers basically line up to buy from two or maybe three suppliers in the IT infrastructure market. Market ? Not really. There aren’t enough suppliers to have true purchasing freedom. And so the marger of Dell/EMC means that CIO have just lost of signifcant number of suppliers. They should be saying that this deal is bad for customers because they are losing buying power. While 53% of respondents view this breadth of offerings as a potential benefit, we find it significant that customers are more likely to expect an increased level of innovation. To the extent that Dell can deliver on this vision and harness the innovation coming out of EMC, VMware, and other Federation brands, that should bode well for customer loyalty to the new combined entity. If there is less competition in the market, why would Dell want to increase its innovation ? Innovation costs money for research, developement and failed product. So I’m not sure that this is causation/correlation holds true. As the Enterprise Storage and Networking markets demonstrated for the last decade or so, dominent market share reduces innovation to a pace that suits the profit margins of the dominant company. Maybe IT executives see the deal as a reduction in workload. Instead of having to wade through the sales process of two companies with meetings, golf games, dinners and endless meetings over discounts and failed delivery, now I will have one supplier. Is that 50% less work ? Maybe, but your ability to negotiate from a postion of strength is weaker. 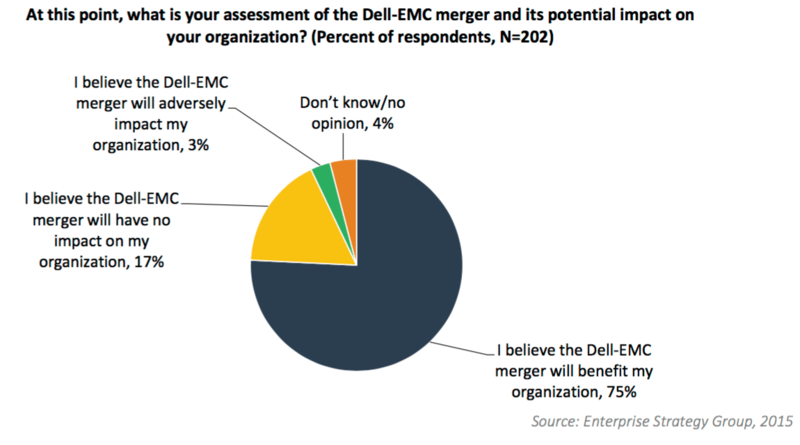 The Dell/EMC deal may or may not be good for customers. On balance, I think it probably is a good result. But IT managers should be seeing the downside of reduction in suppliers as potentially damaging to pricing, solution diversity and market dynamics. If not, why not ? Are we all moving the to public cloud so buying hardware doesn’t matter ?